Fluorescent lighting is mainly used to create an ambient affect within this retail setting. 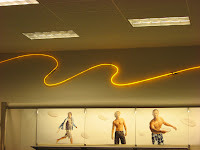 LED lights are used to highlight certain areas and advertisements. 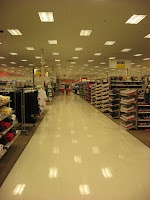 Slight reflectivity is seen in the flooring created by the fluorescent light sources. The quality of light is persistent throughout the space. The edges of the store are darker, with slight color created by the LED fixtures.